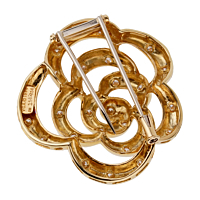 A beautiful flower diamond gold brooch from Van Cleef & Arpels, circa 1990's. Made in high polished 18kt yellow gold the brooch has an open, three dimensional design with soft edges and fluid movement. 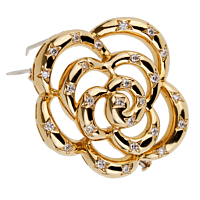 The flower-like design is interspersed with round brilliant cut diamonds. Pendant Dimensions 1.57" by 1.45"